Our typical harvest on a single day, at least three times a week! Our little slap-and-dash trellis has definitely done its job. I set it up to support a volunteer mini bittergourd plant that started growing just under the canopy of one of our peacock flower trees, and did my best to direct the plant away from the tree, lest it grow upwards and beyond our reach. That was two and a half months ago, and since then, the vine has flourished. Besides covering the entire length of the trellis, it has branched out multiple times and is thick and healthy, and oh so bountiful! 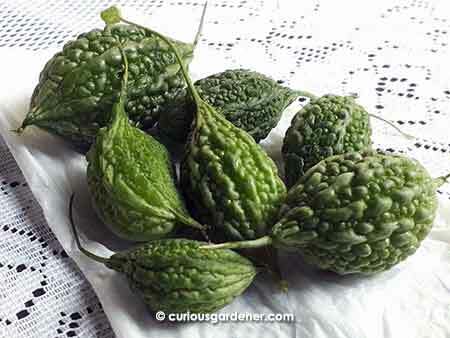 To our delight, it is a different variety of small bittergourd from what we’ve been growing. The fruits tend to be more stout and cylindrical, and can be bigger than what we’ve grown before. There have been a couple of little monsters around 10cm long, and we have a lot of fun going on “treasure hunts” on a daily basis just to see what is growing and how big it can grow! 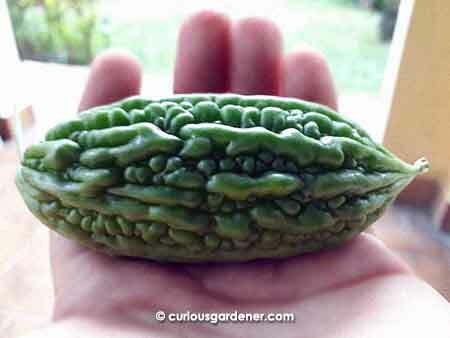 Just one of several clusters of bittergourds on the plant. 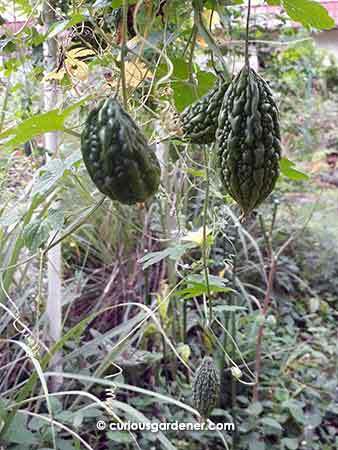 At the moment, the plant is producing lots of fruits. We can harvest six to ten or so fruits a day, up to three times a week. The flesh is nice and crisp, and remains so even when we eat it in a stir-fry. I’m grateful for whichever bird that deposited the seed in our garden. After all, this was how we first started growing bittergourds way back, about seven years ago! © 2017 curiousgardener.com All rights reserved. Taking questions from the class in the cosy home setting. 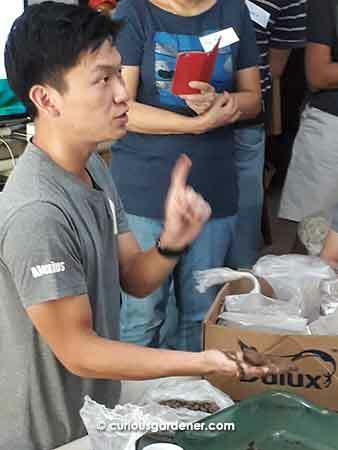 It’s always useful to learn things from those who really know what they’re talking about, so I decided to check out what the Centre for Nature Literacy and Enterprise (CNLE) at the National University of Singapore has to offer. Their Gardener’s Series of workshops caught my eye, and I decided to start at the beginning with the two-day Basic workshop. There were a few pluses that helped with my choice. Firstly, it’s SkillsFuture claimable – meaning as a Singaporean who has received SkillsFuture credits from the government to use for skills development and lifelong learning, I could tap on my available credits to offset the cost of the course. Secondly, the workshop was going to be held at my permaculture buddy Alexius Yeo’s home, and I never pass up an opportunity to wander in awe around his garden! Last but not least, Alexius was conducting the class. 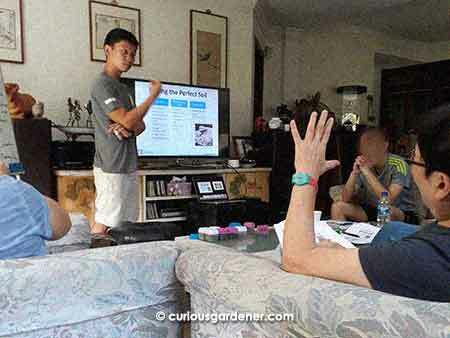 Since he is very passionate and knowledgeable about all things gardening, I knew it would be well worth giving up two Saturdays to learn from him. And so I signed up. Demonstrating the consistency of soil when different components are combined. Looks gross but it’s great for plants! The first Saturday dawned sunny but slightly overcast. Twenty-something of us arrived at the house before 9.30 in the morning – and what a diverse crowd it was! There were retirees, people of working age, and a couple of students; and in typical Singapore fashion, the group was comprised of different races and religions. Some people had more experience than others, but the atmosphere was open and good. We were all there to learn, not just from the class, but it appeared there were tips we could also pick up from one another since we had different areas of interest that we each dabbled in. The first part of the first day was a little heavy on theory, but it was good to start with basic knowledge. Then it got more interesting when we got into the components of soil and how to mix them for different purposes. Samples were passed around, and Alexius demonstrated different ways of combining them for different types of plants. We took him very seriously because he was sharing hard won experience, and we could clearly see the results in his garden. How to prepare the stem for marcotting. The second Saturday was a bit more hands-on as we learned different methods of propagation and tried them out after Alexius demonstrated them. There was also more opportunity to interact with each other while waiting for our turn to try preparing stems for grafting and marcotting, or during the breaks. We had potluck lunch on both days since we were at Alexius’ home, and it was a good time to circulate and get to know each other. I was tickled to find that I’m not alone in loving to experiment with growing new plants, as many people wanted cuttings and seeds, and had already tried growing interesting plants. One of my classmates was so eager to get her hands on the multi-petaled blue pea flower plant that she gave me a lift home so she could get some stem cuttings from our garden! Naturally, everyone had questions to ask about their own plant-growing experiences, and Alexius fielded all of them adeptly. He may look young, but he’s one of the trailblazers in the urban farming movement here, and is quite the veteran. 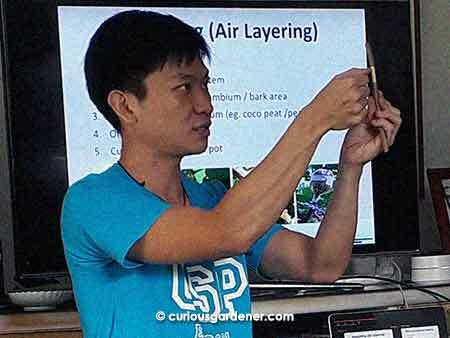 There were questions ranging from how to grow certain types of plants to how to manage pests and plant diseases, and more. 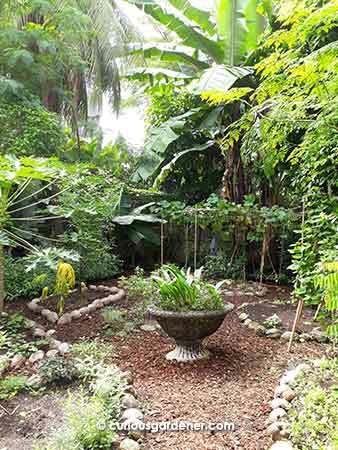 Alexius’ permaculture garden is cosy and serene. The second session wrapped up with a discussion on the uses and how to best grow some of the interesting plants in the garden. Moringa, basil and sand ginger were familiar, but there were less common ones, like Wandering Jew, joy weed and Moses in a cradle, which can be used to make a cooling tea. There were many more plants discussed, but you should go for the workshop if you want to know more about them. It certainly provided good entry level knowledge for gardeners and had lots of great tips thrown in along the way, and for my part, also gave me a few more gardening buddies. It was definitely worth giving up part of my weekend for this! 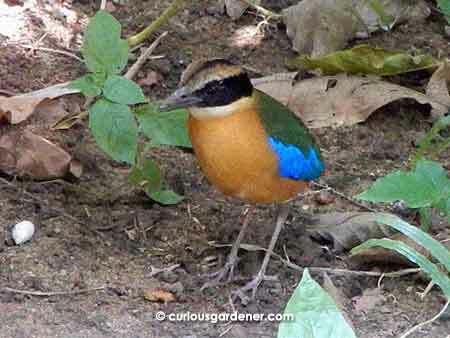 Our little buddy, the Blue-winged Pitta has come back again. Whether it’s the same one that we’ve observed in the past is anyone’s guess. However, the challenge is back on to try to get good photos of this gorgeous jungle bird. 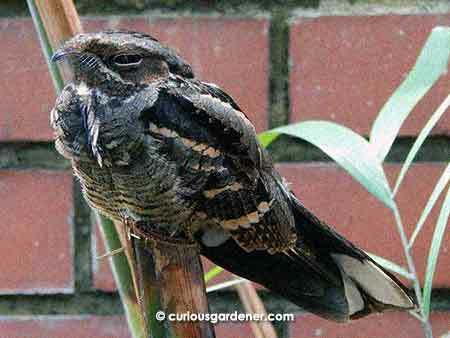 This odd-looking bird had us scratching our heads until we discovered it’s a nightjar. This nocturnal bird used to be common when I was growing up. I loved hearing their calls echoing along our lane at night. It was a comforting sound. We knew recently that there was at least one nightjar in the neighbourhood as we’d heard the calls occasionally over the past half year. Seeing it resting in our garden during the day was exciting, to say the least. It has been observed a few times, and we hope it keeps coming back. Now this bird is one we don’t have the identity of just yet. 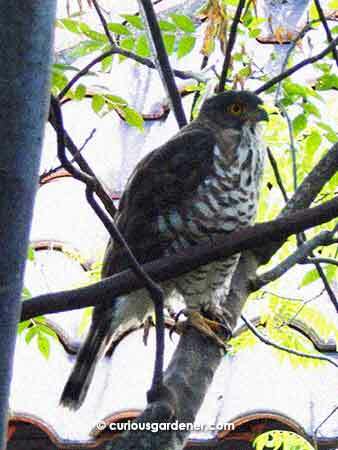 We spotted it resting in the curry leaf tree one morning and think we’ve seen it a couple of times before, but those sightings were fleeting, so I can’t say for sure. It looks like a bird of prey to me. Gorgeous, isn’t it? Water is so crucial to life. In survival situations, we can live without food for more than three weeks but only for about three days without water. Plants, too, need plenty of water, and in learning about permaculture and how to establish a homestead, a source of water is the first thing one needs to attend to – for people, plants and any animals you may have. 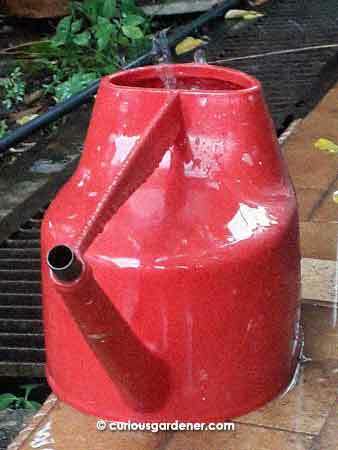 Harvesting rainwater in a watering can makes it easy to transfer the water to other containers! Okay, so we don’t have a rural situation here in Singapore, and we’ve got an easy supply of water and utilities available. However, it comes at a literal cost. A rising cost, too, where water is concerned. I know that I cringe a little when I have to water our plants on hot days – when the watering can fills with water from the tap, I almost hear the tinkling of coins… It’s also been quite a while since I stopped watering plants out in the garden unless they’re young and need the help. If they can’t survive in our climate, I choose not to grow them. It’s only our nursery and potted plants that get the TLC. So why don’t we collect rainwater? It’s free, isn’t it? Well, I recall some time ago that it was not legal to do so here. OMG, some people will exclaim, everything is so controlled in this country! Well, yes, but there’s a reason why this was so. It’s a small country with limited water resources, and an increasing population. The drainage system was designed to collect rainwater and channel it to the reservoirs. At some point more than ten years ago – I think it was 2004 – the rule about rainwater collection was finally changed. I think that was when the goal of using two-thirds of the country’s landmass as water catchment was reached. So, yes, we can now collect rainwater to water our plants with! It is only for non-potable use, though, meaning it shouldn’t be used for drinking, cooking and bathing. Before you start getting any grand ideas for irrigating your garden, though, you’d better check what’s allowed. Yes, of course there are rules and regulations! Some people complain that too many things are micromanaged, but I believe there are good reasons for these. Not everybody has the good sense to know how to manage what we may think are basic issues. What’s so difficult about harvesting water? Well, the biggest concern to me is the pesky mosquito. If you’re not careful, mozzies will start breeding in your stored water. This happened in our neighbourhood more than fifteen years ago and there was an outbreak of dengue fever, which I was unfortunate to get. So, I’m all for people getting educated about the correct way to do things. If you intend to plumb collected rainwater into your house, it’s best you employ professionals to do the work as they will know what’s required by law. This would include doing both the piping as well as knowing the best ways to prevent mosquito breeding. Besides watering your plants, this water could be used for general washing and flushing toilets, too. So let’s think about how you’re going to harvest the rainwater. I tried simply placing a container below the edge of the roof where water drips down when it rains, and that worked very well. I guess if you’re more ambitious and want to collect more water, you’ll need to look into doing some piping that leads into a storage tank. That, of course, needs to be mosquito-proofed, meaning that there should be no gaps anywhere, it should be covered with rust-proof fine mesh, and sealed shut when not in use. NEA recommends that the water should not be stored, unused, for more than seven days as this is enough time for mosquito larvae to reach adulthood. To play it safe, you can also use larvicides that are not toxic to people and animals in your stored harvested rainwater. 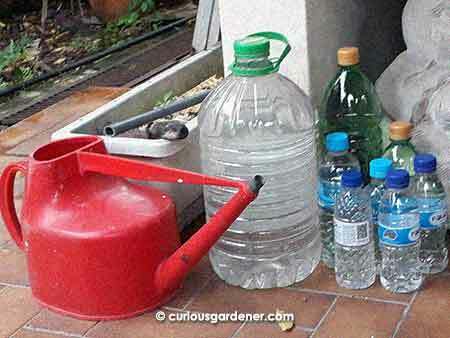 For my current simple needs, I used a 5-litre watering can to collect rainwater from roof edge drip, then transferred the water into recycled plastic bottles with screw tops for storage. It took less than ten minutes during steady rainfall to fill the watering can, which I repeated until I ran out of bottles. Now I need to store the bottles away from direct sunlight so that algae doesn’t grow in them. They hold over a week’s worth of water for our potted plants. This may be the start of something bigger, because I wish I’d saved more bottles, or had more of the large bottles! If you want to find out more, visit the Public Utilities Board and National Environment Agency websites. Enter your email, confirm you want updates & you'll start getting them! The new Keng Hwa flowers! Gardening is good for the soul! Enter your email, confirm you want updates & you'll get them!